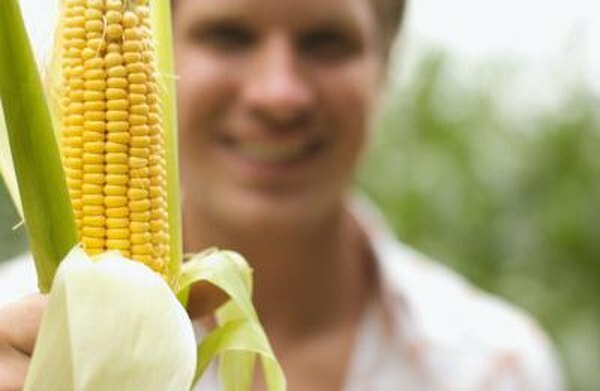 Those golden-yellow ears of corn have many uses, including being milled down to a white or yellow flour that can be used for breading or in baked goods recipes. Besides being a tasty addition to recipes and containing nutrients, such as vitamin A, magnesium and iron, cooking with corn flour can offer benefits to your digestive system. This includes being a good choice for those with celiac disease who cannot digest gluten. If you are ready to reap the digestive benefits of corn flour, you can incorporate it into a variety of dishes, from entrees to desserts. Corn flour has traditionally been used in Southern-style cooking, such as in making cornbread or breading fish or shellfish, according to “The Atlantic.” Desserts, such as Chess pie and a variety of cake types, can be made with corn flour as well. Corn flour also is used as a breading in many Italian dishes, such as chicken Parmesan. Gluten is a protein found naturally in grains, such as wheat. Those with celiac disease lack the enzymes needed to break down this protein, which can result in small intestine inflammation and a number of uncomfortable symptoms, such as cramping, nausea and stomach pain. If you have celiac disease or are especially sensitive to gluten, your physician may recommend avoiding gluten-containing products, according to the Colorado State University Extension. Corn flour is a naturally gluten-free food, which means it may offer digestive benefits. Those with celiac disease can consume and cook with corn flour without fearing digestive symptoms that can accompany eating gluten-containing grains. Corn flours are available in many types, from white to yellow corn flour to Masa Harina, a special corn flour type used to make corn tortillas, according to Food.com. Corn flour produced from whole corn kernels is considered a whole-grain food. ChooseMyPlate.gov recommends consuming whole-grain foods to reduce heart disease risk and provide vital nutrients. Whole grains also offer the digestive benefit of reducing constipation. Whole-grain corn flour is high in fiber, containing about 7.3 grams per 100-gram serving, according to the U.S. Department of Agriculture. This fiber travels through your digestive tract and absorbs water to help your stool move more easily through your body. Another critical digestive aspect of fiber-containing corn flour is that it enhances feelings of fullness, according to ChooseMyPlate.gov. Fiber is more slowly emptied in the stomach than its refined-grain counterparts. As a result, your body is supplied a steadier stream of energy and you feel fuller, longer. Refined grains, such as white bread or white rice, do not offer the same fullness-inducing benefits.